Sometimes forget to walk before you run? It’s only natural, especially for not-for-profit leaders. If you are reading this, you live and work with purpose and it’s highly likely you also want to solve our complex social and systemic problems. This is no mean feat and there is no playbook. However, our work with many incredible leaders in the for-purpose sector has signposted a pathway that might help guide your organisation to achieve the social impact you’re looking for. This pathway involves transitioning from being a sustainable organisation to a place where you are driving enduring impact and system reform. It is not very well signposted and sometimes feel like Indiana Jones crawling through spider webs in the Temple of Doom (showing my age here). Regardless, we would like to share some signposts with you. The path is built on three philosophies that dictate a well-formed strategy: value based design (deliver what stakeholders value not what you think they need); defend and extend (be the best at delivering your value proposition before trying to conquer the world); and partnerships (we can’t and shouldn’t do it alone, and together we can do more and do it better). Once you start applying these three philosophies to each and every part of your strategic plan, the foundations for your version of the pathway are set. With these fundamentals in place, your organisation is well-placed to consider the following journey:  sustainable business model;  enduring scaled impact; and  enabling environment. These shouldn’t be viewed as a linear process that follow one another in a chronological manner. Different parts of your organisation may be at different points on the journey – that’s okay. To achieve maximum enduring impact, the key is to work out where on the path each part of your organisation needs to be and when. There is no quick fix for multi-faceted, entrenched social issues. To address them, organisations need to be able to work and influence repeatedly and over an extended period of time. This requires resources, stability and longevity. So, it is absolutely critical that social sector organisations have a sustainable business model in place. One that results in a balanced income stream from a variety of sources. But where to start? Delivering value is at the heart of organisational sustainability. If you nail your value proposition, funding should fall into place relatively easily. To unpack the value that your organisation creates for stakeholders, ask yourself ‘what problem am I trying to solve and for who?’ Ideally, you also want to ask your constituents for their input and genuinely listen to their insights. Ultimately, there is an exchange of value for income. Sometimes the customer or beneficiary pays for a product or service. Alternatively, another party (such as government or philanthropy) pays or subsidises the cost and there are also ways to use your underutilised assets. A business model has a whole range of other components but that’s a story for another time! For quite some time, scale and Spark have been wrestling…and not in the way you might think. Some consider scale as the inevitable aspiration for all impact seekers. We disagree. Big does not always mean better and size misses the point. The key is about scaling impact not organisations, in a way that can endure. A perfect vehicle for this is partnerships and we love cross-sector partnerships best. Where sustainability is largely an internal aspiration, enduring scale is an external one that is focused on collective impact and in proving that the solution you are part of is evidenced. Scale should not be about being big; it’s about balance and being appropriate for the long run. From there, you are well-placed to ask yourself if the social solution could and should be ported elsewhere and whether such a porting will require a change to the enabling environment. This signpost is about the big picture and the many things that are beyond an individual, organisation or even sector’s influence. Advocacy is a part of facilitating an enabling environment but advocacy alone will not be enough. Practically, it is about identifying the macro drivers that need to change so as to enable the social solution to thrive either in situ or in many places. 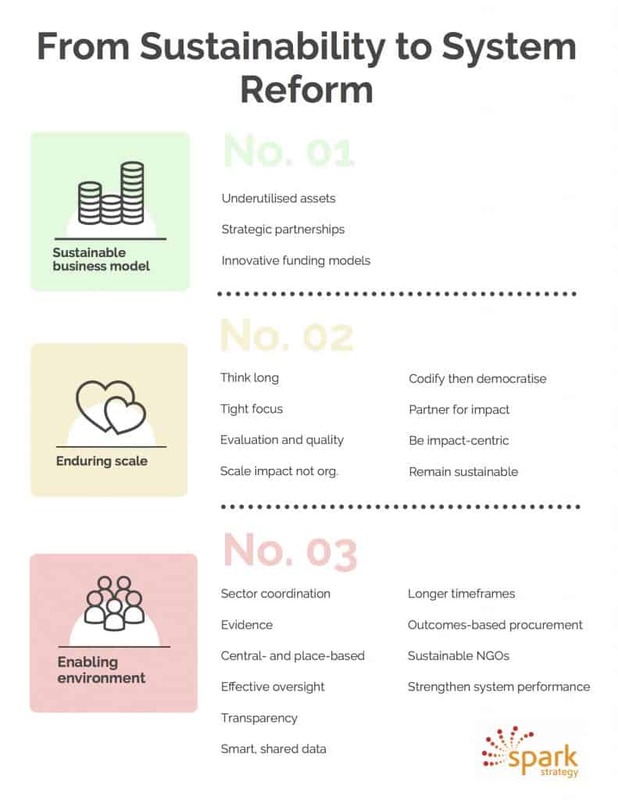 Here are some areas to consider when thinking about system reform: look to enable whole-of-sector coordination; use outcomes frameworks and link these outcomes to procurement; seek smart and shared data; encourage longer time frames for delivery and assessment; and source, add to and share evidence. The key takeaway when it comes to the enabling environment is to unpack all the things that influence the social initiative and that are beyond the control of any one person or organisation. Then, it is critical to ask and work towards what good looks like for each influence. This is a big, brainy task that requires thinking time and resources to undertake. Hence why you need to be sustainable so as to allow yourself the space to consider system reform. Also, remember that system reform is a little like research; it involves experimentation and the ability to afford failures along the way. Is it really as easy as one, two, three? No, it’s not. Working with non-profits, government, corporates and philanthropy shows us that contributing to meaningful social change is rarely easy. But it is vital that we, the for-impact sector, agitate and mobilise. That we propose and develop solutions, interventions, treatments, products and offerings. That we advocate for policy change, legislative change, attitudinal change and behavioural change. That we remain aspirational and positive. We’re not saying this isn’t already being done. There is a huge amount of amazing work being done in the social sector and at Spark we are incredibly lucky to see and support some of it. What we are saying is that social problems are complex and difficult beasts but solvable with sustainability, scale, system reform and a little help from some friends. The idea of walking then running doesn’t give us permission to procrastinate. It doesn’t give us the rationalisation to surrender to the risk averse impact prevention officers many organisations seems to collect. Nor does it mean we can’t make an impact without being big. We have a terrific poster in our office that says, ‘if you feel you are too small to make an impact, try sleeping with a mosquito in the room’.